With the popularity of Quentin Tarentino’s other writing and directing achievements, Jackie Brown tends to get short shrift. Based on Elmore Leonard’s novel Rum Punch, it’s the exception in Tarentino’s film arsenal where the story concept didn’t originate from the mind of Tarentino. Yet there are enough changes made by him to make 1997’s Jackie Brown a standout film for the heralded director, and it may very well be his best all-around film, full of style, suspense, and pulp cool. The prime reason for that is his handling of the character of Jackie Brown as a tough, no-nonsense survivor, and Pam Grier’s ability to fill those shoes perfectly. The cast of top Hollywood stars and character actors, including Samuel L. Jackson, Robert DeNiro, Bridget Fonda, and the great Robert Forster fills in the remaining blanks. 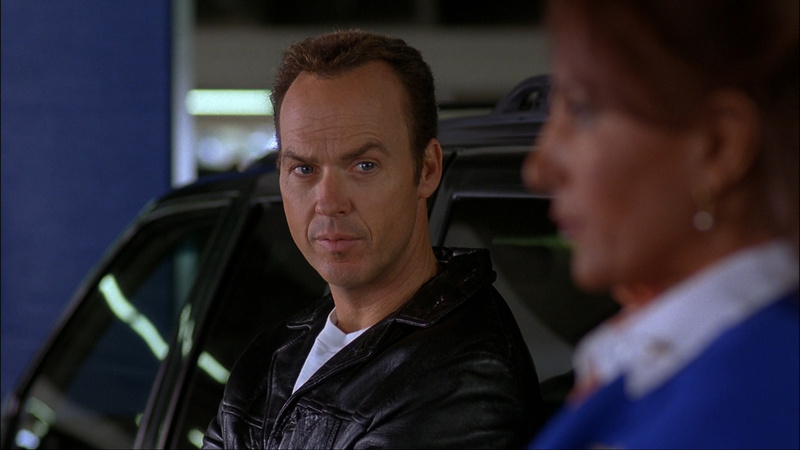 But you may forget the key role played by Michael Keaton as straight-shooter cop Ray Nicolette. Keaton played a supporting role in a previous ensemble cast effort under a popular director, Kenneth Branagh’s Much Ado About Nothing, as Dogberry, the closest on-screen attempt at showing what Charles Schulz’s Pigpen would look like all grown up. Part of the conceit of Keaton’s new film Birdman is the intended irony of a washed-up actor that once played a popular character called Birdman, and the obvious comparisons to Keaton’s Batman and lack of promising acting gigs in recent memory. In fact Keaton has always been a working actor plugging away at film roles through the years and Dogberry, along with Jackie Brown’s Ray, may have helped fuel the vibe since Keaton was either content to join these ensemble casts with small parts, or that was all he was offered. Either way, these weren’t major leading man roles as he has found with Birdman. The decision to place Keaton in the role in Jackie Brown was well-conceived. His Ray is the good cop in the pairing of a mild good cop/bad cop routine with the more aggressive and sly Michael Bowen as Mark Dargus. Tarentino wants us to cheer for Jackie Brown, and the care we have for Keaton makes us want to “help him help Jackie.” He never goes quite that far, in fact he blackmails her, in that way only film police can, into assisting with his investigation by ratting out Samuel L. Jackson’s money laundering operation. Tarentino is savvy about his casting decisions. He taps actors he knows his fanboy and fangirl-based audience wants to see inhabit his quirky characters. He loves watching Keaton in movies and knows we all do, too. Ultimately Ray partners with Jackie to accomplish his goals, and almost as a price for pressuring Jackie he must fail in his task, as Jackie turns the tables and plays him instead. As an audience we don’t mind—Keaton never crosses the line toward the sleazy or vile as we find the case with many Tarentino roles. Ray acts within the bounds of the law and simply gets played by a better player. And we like seeing Keaton in this kind of part. We’d love to see Keaton pop up a few times a year in great films like Jackie Brown. Even last year Keaton played a completely different character but with similar screentime as Raymond Sellars in the remake of RoboCop. There he relied more on that characteristic Keaton head tilting and tics that early on became part of his shtick dating back to Night Shift, Mr. Mom, and Johnny Dangerously, even through his role as Bruce Wayne in the Batman films. Sometimes that can be seen as annoying, yet it fits when he plays a character trying to exhibit a certain amount of angst. But we don’t see as much of that with Ray, although even Ray gets the chance to have a frustrated Keaton signature blow-up scene once he realizes all his efforts have been thwarted. Ray gets a key role in Tarentino’s escapade, and Jackie Brown is a better film for it. For fans of Keaton and Tarentino, it’s a double-win. Check out Jackie Brown for all the reasons above and more On Demand, via Netflix, or at Amazon.com here .